What is the bright orb in the sky? Nearly a week without sun, bad for the psyche and some of the crops. Unfortunately it looks like it will not last long, maybe through the first part of Sunday. We will have to move fast to get more things planted, especially the big planting of winter squash. We have had an erratic history with winter squash but this year we are screwing ourselves to the task of doing an excellent job so we can have plenty to sell through next winter if possible. We have had many kind words about the article this week in the N&O about our former staff who have gone on to run their own farms. Many great people have passed through the farm from our first real employee Greg Dusenberry to Liz and Jennie now on staff. We never set out to train new farmers, we just want to equip them with the information they need to do a good job for us and to treat them as well as we can. This business has so many moving parts that for them to understand why we do things the way we do and consequently want them to do them that exactly way, we have to teach them about the whole business not just how to pick turnips. 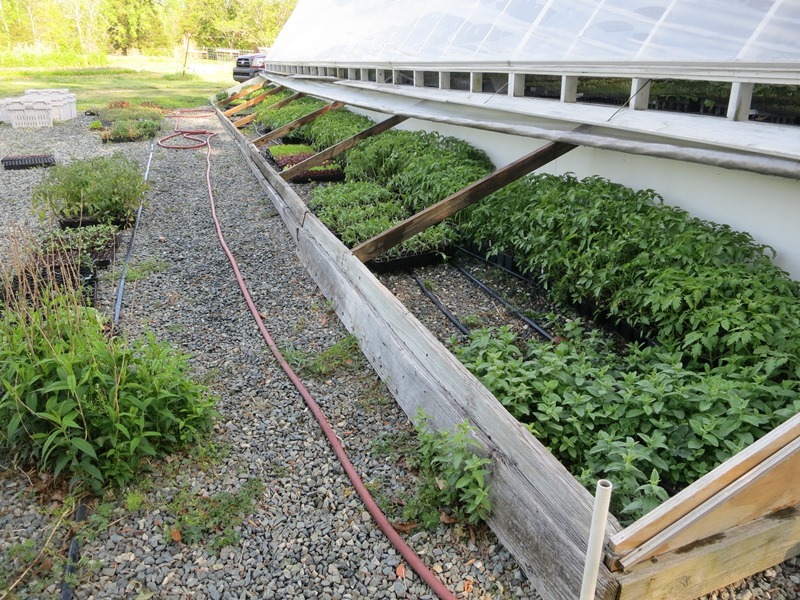 We are proud of all the “full season” employees we have had even the ones who decided that farming wasn’t for them, as that is a more important a thing to learn than how to trellis a tomato. 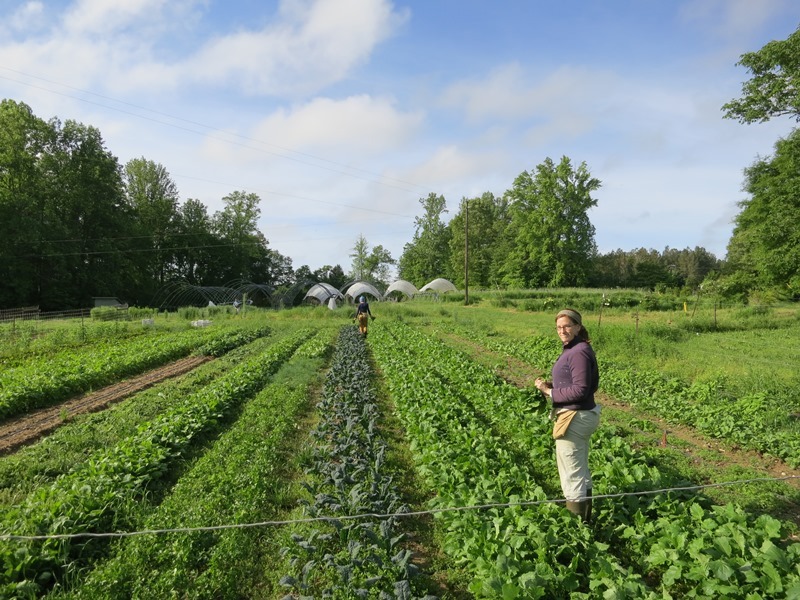 We have been very lucky to mostly hire people who already had worked on other small farms and had a real desire to have their own farm someday, not just something to do for the summer. Mostly we were just fine tuning their skills, in many ways we have been their last stop before they actually jumped off the dock and swam to their own operations or went on to graduate school. Farming is not an easy business and you have to really be committed to doing it, there are many reasons why we are less than one percent of the population. 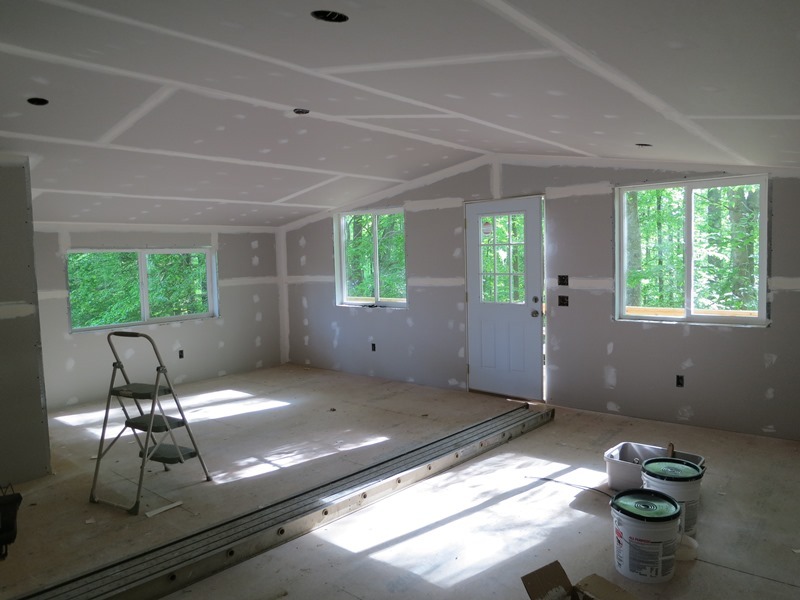 One good thing about the drizzly weather, it made it easy to go inside the building project and work on the sheetrock. Great strides in that direction, another few days and we can roll on some paint and call the electrician in to finish it out. Whoopee! Tired today or at least a bit sore. 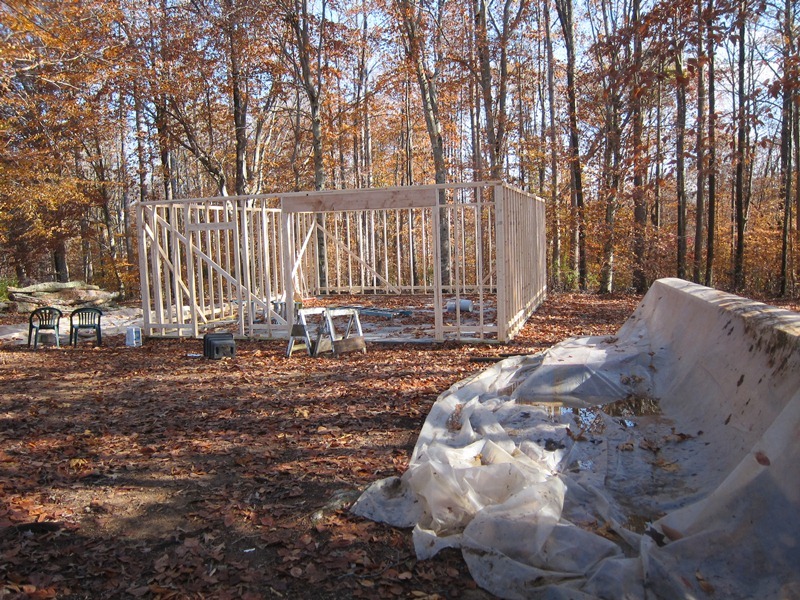 Two mornings of splitting firewood and two afternoons of hanging sheetrock in the new building. Not too many jobs have as many awkward moves and lifting of heavy things. There always seems to be a period in the spring when we have to spend a day or two tying up projects that didn’t quite get finished over the winter. This spring no exception and the workshop project of course will continue to take a lot of time and attention for the next month. The firewood is of course a perennial project, we heat the house with wood, always have. We now have “heat on the wall” but only use it when we go away and don’t want the pipes to freeze. With fifteen acres of woods there are always trees that need to be cut up from storm damage or just dying. This year of course were the four big trees that came down in the big storm last July that blew down the Big Tops. With so much going on we haven’t had time to finish cutting them up until the last month. It is nice to have the front yard unobstructed again and as a silver lining to the storm damage, a years’ worth of firewood “in the dry” as my brother would say. The main job this week continues to be getting the big planting of tomatoes in the ground. Jennie and Liz have all the irrigation and fabric on the beds and today will get all the trellis built. Tomorrow, in the cloudy and showery weather, will be the perfect conditions to transplant the big plants so they will have very little transplant shock. Still need to sucker (prune) the early tomatoes and move the peppers up to their bigger containers, hopefully by end of Friday. For the second year in a row we will not be on the Farm Tour this weekend, just too much going on. If you go, have a good time, we will be hanging sheetrock and other fun pursuits. Jennie keeps asking “what is with the wind?” I reply it is always windy in March, just the spring battle of the jet stream as it begrudgingly moves north. Combined with what appears to be the 5th coldest March on record and it is irritating. I think that because 2012 was the warmest March ever it is even more noticeable. I always find some comfort in knowing it could be worse like 1960, the coldest March ever, when the average temperature was a full seven degrees colder than this past month at 37 degrees and it snowed 14 inches! 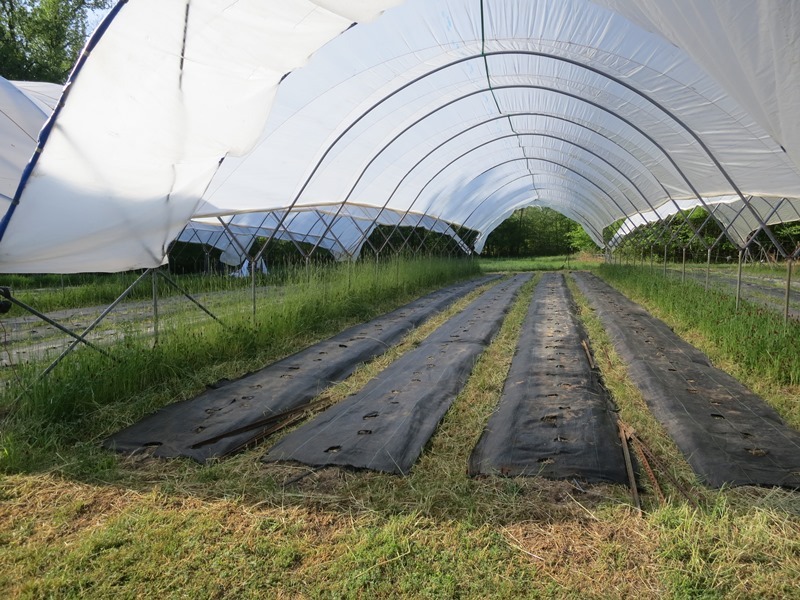 Big week, we slid the little tunnels over the beds that will be home to the early tomatoes and cucumbers. With the help of a few students from the Sustainable Ag. Program at CCCC the six of us pulled the 16’X48’ hoops to their new positions for the year. A week behind schedule but still OK considering the weather. We closed them up tight to heat up the soil as much as we can before we transplant the tomatoes on Monday. Always good to get that job behind us. With the winds the soil has dried out nicely on top and it is a good time for us to get the first cultivating/weed control done for the year before we have to set up irrigation. 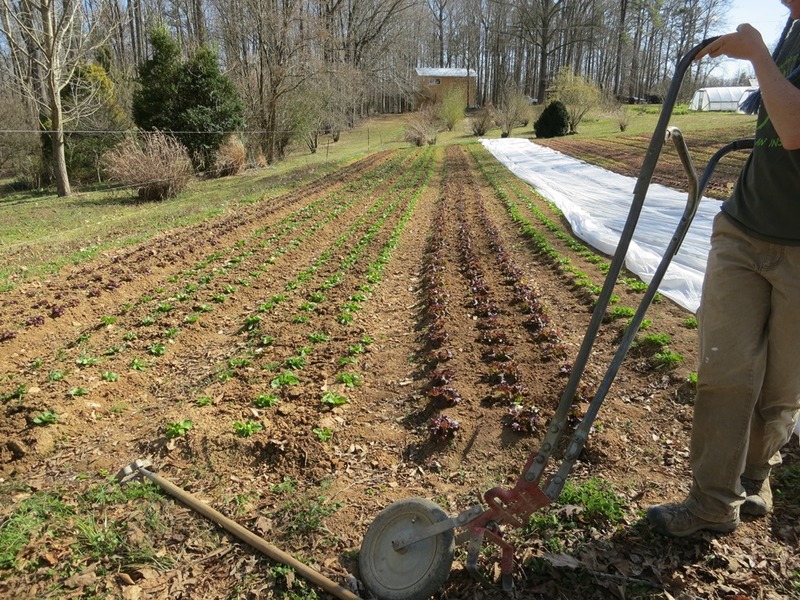 We pulled all the floating row covers off and Liz ran the wheel hoe through the first lettuces and spring vegetables. The sad part is with little real rain in the forecast we will soon have to fire up the irrigation system. The building project is getting closer to complete. We passed all the rough in inspections and insulation is nearly done, the sheetrock arrives today. Any day now Duke Power will show up to trench in the new power line and soon thereafter a new septic system will be installed. A little sheetrock mudding and paint and we can call it done (mostly). Whew, just in time for the busy growing season. It is all about getting the workshop/apartment dried in before Christmas now. I do these big construction projects so infrequently (every 5 or 6 years) that I have to re-learn all kinds of techniques and skills that I just don’t use every day. Takes me what seems like an extraordinary amount of time to think through some steps that everyday carpenters just do automatically. One of the great skills that I acquired early on and that every farmer has to have is carpentry. Out of economic necessity it is the only way that we could have built the infrastructure that is needed on a farm, we could have never afforded to hire people to do all the work here. Other farmer friends of ours always joke that farmers farm in the summer so they can be carpenters in the winter; sometimes I think they are correct. We still have the same money constraints but, as a control freak, I also just have to be able to do it the way I want. The unexpected rain this past week and too many meetings that I couldn’t skip has slowed us up by a few days but I have the bit in my mouth now and we are steaming forward. 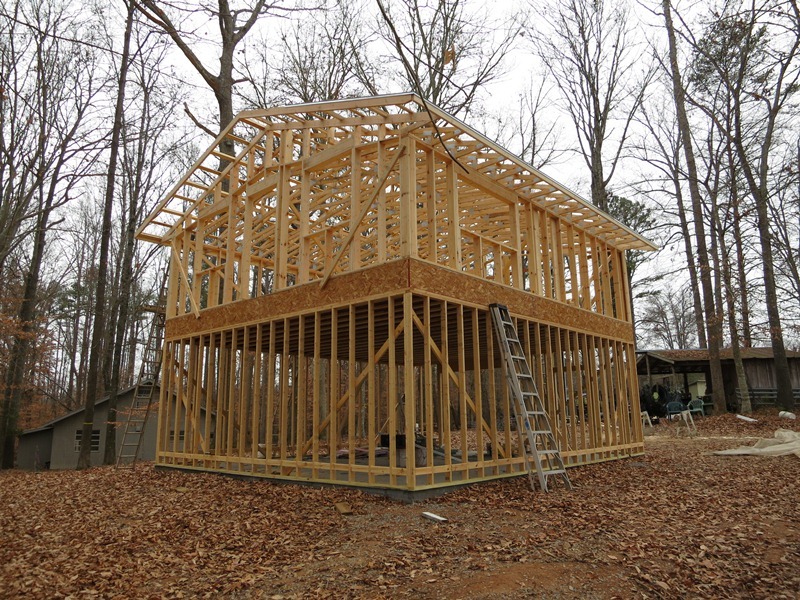 All the framing is now done and the roofing tin arrives today. 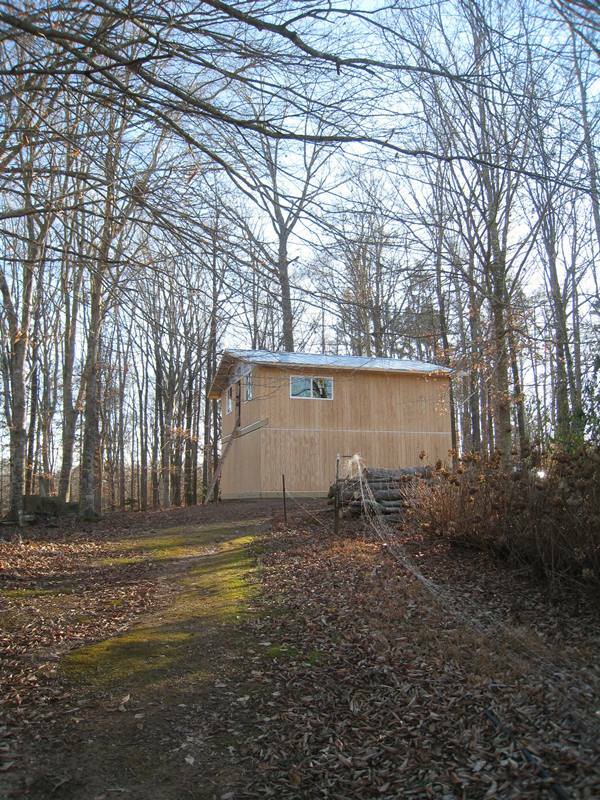 With any luck the roof will be on tomorrow, windows and doors installed Friday and we can start siding this weekend. I told Jennie that we had to have it done before she left for Christmas break next Tuesday. Not sure that is possible but we will make a run at it. We are closing in on the biggest food celebration of the year. This newsletter will cover both this week and next, two markets in 4 days, lots to do! 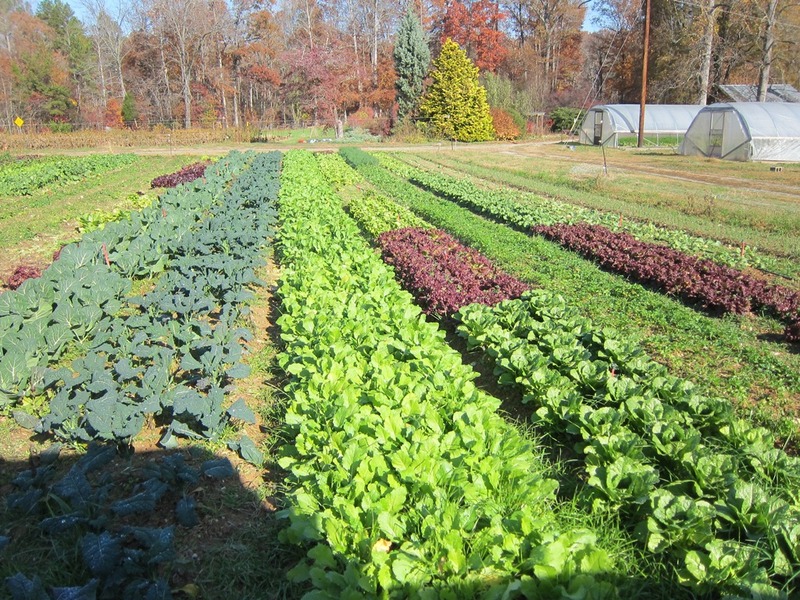 This cool weather has really slowed the crops down but in a good way, they were getting too big too fast and we will have plenty of great produce for both Saturdays market and next Tuesdays special pre-Thanksgiving market. We have been making good progress on the workshop/apartment building. Betsy oversaw the pouring of the concrete slab while I was gone and we now have all of the downstairs wall up. We have been waiting on some engineered materials so we can move on with the second floor but it will all need to wait until after Thanksgiving anyway. We hope to have the roof on well before Christmas. Besides tending and harvesting for market, the last big job in the fields has been to remove the pepper trellis and clean up the field. It is a tedious job as the trellis system is quite extensive with lots of parts that have to be extracted, in a certain order, so we can then mow the plants down. Made even harder this year with the plants laying part way down, despite the trellis, after the 70 mph winds hit them in the big July storm. Thank you to everyone who has asked about the foot and the Utah trip. The blister is now well healed and I have no excuses for getting work done! If you are interested here is a link to my report about the walk. Remember that the Saturday market is now operating under winter hours 9:00-noon. And the special pre-Thanksgiving market is this Tuesday from 3:00-6:00. 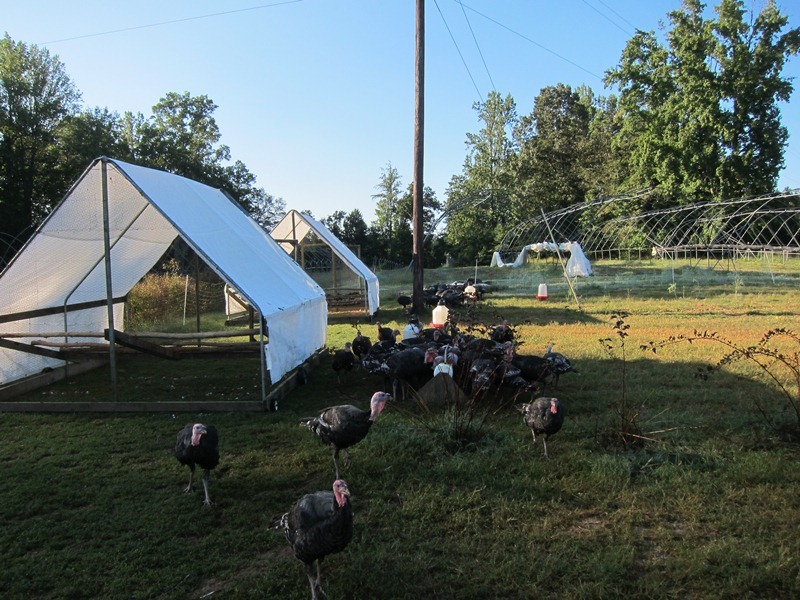 All the turkeys have been sold, hope you got one if you wanted one. Just in time for Thanksgiving we have beautiful Celery. Back for the season are Jerusalem Artichokes (Sunchokes). Nice Fennel for salads, goes well with the Celery. Plenty of the incredible Baby Ginger to go with sweet potatoes or deserts. We will have a small selection of winter squashes too. Plenty of greens this week. Lettuce- Green Boston, Red and Green Summer Crisp in full heads. In Mini-heads we have a few Green and Red Oak leafs and the new sweet Little Gem Bibb type. More Spinach, it looks great. Lacinato Kale, beautiful tender and sweet Collards. New this week- Escarole. It is root season with lots of Turnips, Easter Egg Radish and the storage Watermelon and Black Spanish Radishes. A small supply of Red, Golden and the striped Chioggia Beets. Plenty of sweet orange Carrots and Purple ones too. In Herbs we have Cutting Celery, Cilantro, Dill and Italian Parsley. Still a fair amount of peppers. In sweet peppers there is a small supply of red and yellow bells. A lot of Green Bells. Still some Spanish Piquillos. In hot peppers from, least to hottest, we have Passillas, a few of the very rare Basque Esplettes, still some Anaheims, Poblanos, Serranos and Jalapenos. Glorious weather! This is why we suffer the summers to revel in these kinds of days. Of course now we work non-stop because we can and it is so enjoyable. This is the beginning of the big project season when we have the time, energy and it is time to do some of these things too. The general end of summer clean up and organization of the farm for winter is underway but we have even more shuffling to do as we have had to move years of gathered materials like cedar posts and old pallets to make way for the winters big project, building a new workshop and living space. The only infrastructure item that we have never had is real workshop space. We have had the open air tractor shed with an outdoor workbench from the beginning but I am getting tired of working on things in the gravel driveway. We have also accumulated quite a number of wood working tools over the years and they are tucked away here and there in various buildings which doesn’t lend its self to actually using them in a timely manner when one needs to. So this winter we are building a 24’X28’ space with an apartment upstairs for current staff or to rent in the future. Hopefully we will be pouring concrete within the month. The other looming project, now that all crops are out of the Big Tops, is to finish the dismantling of the bent metal parts and actually get a count on how many we will have to replace. We also have the annual move of hoops from one field to another so quite a bit of time has been spent this week in handling greenhouse parts, either dragging them out of the field for salvage or taking them apart and carrying them to next year’s position. With fall soil preparations and cover crop planting on the schedule in the next few weeks, more fall crop planting and the continuing harvest there are a lot of balls in the air each with its own set of details. Maybe that hiding out in the air conditioning all summer wasn’t so bad after all.